Color:Each Package included 6pcs different pattern placemats shown on the picture above, Colorful and unique, absolutely refreshing. Net Weight: Each placemat 1.59 oz,each package approx 10.58 oz. Care Instruction:Hand wash best,cold water(Not more than 86 degrees Fahrenheit), Lay flat to dry. Please do not soap in the water for too long time to keep the color new,Do not bleach, Do not wring. Usage Range: 1.Match all kinds of styles of furniture,they can be plaed under cups,tablewares,vases and ashtrays as decorations to your dining tables and tea tables. Elegant looking and comfortable feeling, perfect for decorating table and protecting table as well. 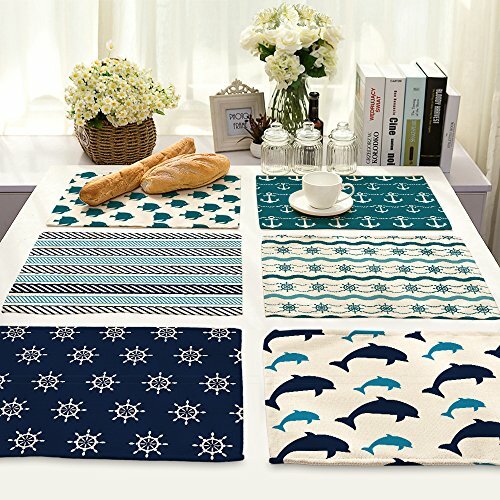 The use of placemats show fashion and high-quatity cultural taste of the owners,a delightful placemat that can make you are in happy mood when eating,it will help improve your dining experience and impress your guests,which is a stylish life style of modern life. Composition:50% Cotton and 50% Linen, high quality eco-friendly. Very durable placemats,free bending,free cutting,pull force non-deformation, designed to last for years with daily use. Sizes:16.5*12.5 inches,each package includes 6 pieces different pattern placemats with rich and bright color, decorate your table. Washable, easy to clean, non-slip, non-stain,Not mildew,Wipe Clean,wearproof,dries very quickly. A Perfect item to decorate dining table, tea table,etc.Effectively protect table from heat, scratches,and food residue.Can roll up to store away,placmats can be flatened when put out to use. Perfect for everyday use, especially for holidays (Christmas, Valentines, Halloween, etc ). Unique design will show your personal taste.